INFJs are known for their insight, their empathy, and their perfectionism. There are some excellent resources out there for INFJs who are struggling with perfectionism, but today’s article is about a nasty side-effect of perfectionism; being a workaholic. 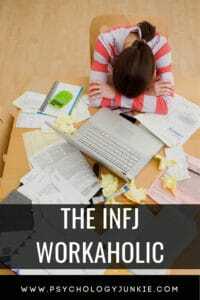 Lots of INFJs (but not all) are workaholics. Why is this so common? What can INFJs do about it? INFJs are extremely visionary people. They have an idealized inner symbol or goal of what they want their future to be. The healthy INFJ thrives in contemplation and quiet meditation about the meaning of things. They consider various missing pieces and clues before they try to move into action and “work”. But workaholic INFJs are so focused, so consumed with reaching their vision that they bypass contemplation in an effort to make their vision a reality as quickly as possible. Many workaholic INFJs aren’t giving their intuition enough space. It’s always there, running in the background, but it may be pushed aside in favor of action, deciding, and forward movement. This consuming feeling with reaching an inner vision can overwhelm INFJs, particularly INFJs who identify with enneagram 1. These INFJs can’t “waste” time, they can’t stop and process adequately, they must keep going and they must make their vision happen. The sooner the better. The other reason INFJs can become workaholics is because they are using Extraverted Feeling (Fe) in a consuming way. If the INFJ isn’t consumed with their vision, or even if they are, they may also be consumed with this need to take care of other people. These INFJs can be “yes, people” who can’t turn down requests for help or even the most minor hints that other people might need them. This INFJ stifles their vision and their need for quiet with a constant flurry of work, giving, helping, listening, and providing. This INFJ feels torn between going after their vision and tending to the needs of others. Any enneagram type can struggle with this, but especially those who identify with type 2 or who have a 2 wing. These INFJs feel a constant push-and-pull between giving their energy to others and wanting to dwell in that quiet, contemplative place that INFJs love so much. INFJs who are parents tend to struggle with this. INFJs are also perfectionists when it comes to their logic. INFJs have tertiary Introverted Thinking (Ti), and as a result they can get stuck in the search for accuracy, for perfection, for not completing something until they have checked off every logical box that can be checked. INFJs can get stuck in internal arguments with themselves about the accuracy of their decisions, their insights, their visions. They can get lost checking over facts, looking for the truth, trying to pin down everything and sift out any unnecessary, potentially flawed logic. Because introverted thinking isn’t the INFJ’s leading function this process can take a while and INFJs can get stuck in a Ni-Ti loop, always wanting to reach their vision, but always getting stuck in that need to make it completely accurate. The more this loop continues the more convoluted their vision and sense of logic can become. This tendency can be especially difficult for INFJs who identify with enneagram type 5. Hunziker uses archetypes to label to the functions, so when he’s talking about the “Hero” he means the dominant function, and when he’s talking about the “Anima/Animus” he’s referring to the inferior function. Extraverted Sensing, the INFJ’s inferior function, is very focused on outer details and responding in the moment. Se-dominant types (ESPs) are usually highly aware of how to enjoy the moment now. They tend to be optimists, people of action, people who know how to have fun and actually prioritize adventure and experience. INFJs who have inferior Se may stifle momentary pleasures, sensory needs, experience and “fun” in favor of reaching their vision or being consumed with their goal for the future. These INFJs don’t take time to “stop and smell the roses” when they really should. They don’t notice the beautiful things around them, the beautiful details, because they are so focused on the future. The moments continue to pass them by as they push forward trying to reach their vision. In this mental state they can miss current opportunities that would help them in the future. I became trapped in this sense of urgency, of panic, that I must keep pushing, keep making myself uncomfortable and exhausted to be free. Now I’m married (to a wonderful guy) and I have four children. I have this vision of our future; that we won’t need material things so much, that we won’t have to live consumed by the need for money. But there are still bills to pay and mouths to feed; there are still four children who depend on me and who need me. I feel like at every moment all four of my children must be perfectly happy and tended to. I feel pushed and pulled between working relentlessly to achieve my vision and my goals and consuming myself with my passion to take care of my family. As a writer I read and re-read my work and find error after error and flaw after flaw. I listen to one personality expert and re-write my articles based on new information, then I listen to another personality expert and he disagrees with the first one. Which one is right? I keep re-writing articles, searching for accuracy, getting bogged down in research and fact-checking. I can’t seem to let go of the mounting pressures and enjoy what’s happening now or the beautiful details that are happening around me. For 2018 I want to be less of a workaholic. I want to be more rested, more patient with others and myself. I’m right there with you workaholic INFJs! I am just as guilty of perfectionism and being a workaholic as anyone else. I get how hard it is to push yourself to this unattainable standard and feel like you must continue striving and never give up, and never stop to take a breath. With that in mind, here are some steps I’m going to take to end my workaholism this year. I hope they’ll help you too! If you’re working so much that you’re not sleeping enough, you’re losing your temper, you’re becoming anxious and stressed, then it’s not good for you. It’s tempting to think of our workaholic nature as a necessity and as something to be proud of. While I’m all about having a healthy self-esteem, thinking that workaholism is a good thing can bring out nasty long-term effects for your health and relationships. INFJs like having a schedule and a plan. Look at your day and figure out a section of time you can block off for rest, relaxation, and family. Turn off your phone too! A lot of us have our work tied into our technology, so it can be tempting to check those work emails, manage that social media account, or say yes to another request for help. Put your phone away and focus on your own needs. As an INFJ you can get sucked into giving all your time and energy to others. You listen to and encourage others and you try to help them when they need it. You need put yourself on that priority list. What do you need? What would you tell yourself to do if you were your own friend, your own mother, your own sister? Would you tell yourself to take on extra hours at work? Would you tell yourself to never make time for rest? Probably not. Give yourself the same courtesy you give the people you care about. Give yourself permission to stop thinking. As an INFJ your mind can get stuck in constant loops of thoughts, insights, visions, thoughts, empathy, questions, worries, curiosities. Take some time every day to consciously slow down, breathe, relax, and rest your mind. When people ask you for help or advice sometimes it’s okay to say yes. But it’s also perfectly okay to say no, too. Sometimes it’s the wiser thing to do. Pause before saying yes to someone, consider the schedule you’ve made and your own needs. Remember you’re dealing with two people; that other person AND yourself. You matter. There’s a lot to be said for selflessness, but you don’t want to deteriorate yourself and your well-being in the name of selflessness. Practice saying no and being okay with it! Nobody’s perfect. We’ve all heard that before, right? Remind yourself of that. Over-thinking what you did wrong, how you’ve failed, and wanting to examine and re-examine your projects/choices/failures can be a trap many INFJs fall into. Practice being okay with imperfection. This can mean occasionally (when appropriate) letting a child solve their own problems when you desperately want to solve it for them. This can mean publishing that eBook even when you’re SURE it could be better if you proofread it 50 more times. This can mean getting your portrait taken even if you haven’t lost the 30 lbs. you wanted to or you have acne. This can mean having peanut butter and jelly for dinner so that you have time to relax and contemplate. This can mean putting off a clean house/work project/phone call because you need to get enough sleep. Do you have any suggestions for INFJ workaholics? Share your experiences and thoughts with other readers in the comments! You can also learn A LOT more about the INFJ personality type with this INFJ starter kit and course from Personality Hacker. Me to a T. Thank you for sharing and for the reminders to take better care of myself.